Venom Motorsport are premium stockists for the Goodridge brake hose kits and can offer some superb discounts. We have been stocking Goodridge brake hose kits for a good few years now and would happily recommend these kits to all of our customers. Goodridge brake hose kits are a brand leader and we felt it essential to add this product to our range. Venom Motorsport was established in 1997 and we have over 10 years’ experience in the Performance Brakes market. Goodridge brake hose kits are a brand we believe in, and rely on. Goodridge brake hoses feature small internal diameter hose design for flexibility, also designed for extra strength, stainless steel braiding also helps to dissipate any heat better than the standard rubber. All these features come together to give between 10 and 25% more braking efficiency. Goodridge kits feature the finest quality stainless steel braided hose, which improves braking performance, eliminates the spongy feel of rubber hoses and provides superior resistance to corrosion. Hose end fittings are zinc plated steel as standard or stainless steel as an option for added resistance to the elements. Why stainless braided hoses over OE items? Stainless steel braid and fittings resist the elements better than standard rubber hoses increasing the life expectancy of the parts. What makes Goodridge Hoses better than the rest? Goodridge continuous product development programs ensure that they are always at the leading edge of development in high performance fluid transfer. Goodridge work directly with leading automotive marquees (Jaguar, Aston Martin, Bentley) using and applying the technology that they develop for the demands of the world’s top race teams. Goodridge hoses are manufactured to the highest tolerances, using the most advanced materials available to minimise weight whilst maintaining the best flow rates and flexibility in the marketplace. Goodridge quality procedures, at every stage of manufacture, ensure reliability, outstanding performance, and the assurance of the Goodridge guarantee. We offer a complete range of Goodridge brake line kits, as direct replacement, for almost every make and model going back over 20 years. If they don’t cover your model, they will make it to your original samples. If you can’t see what you’re looking for please call or email for further assistance. 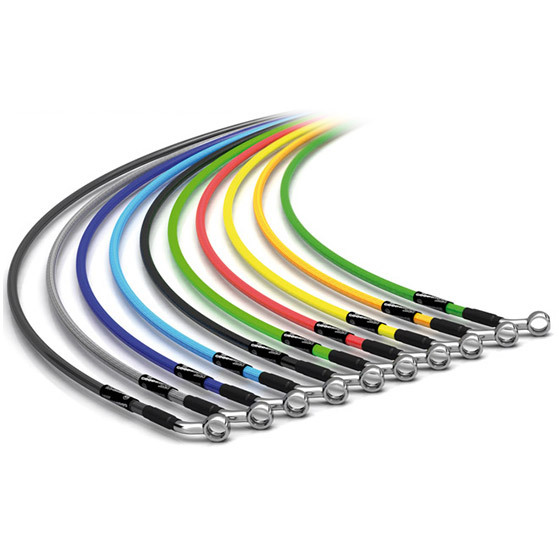 Goodridge are the only company that offers a "Lifetime Guarantee" on its Stainless Steel Brake lines. If there is ever any problem related to manufacturer defect, the kit will be replace free of charge, no questions asked. Goodridge is the only company certified to manufacture stainless steel brake lines for use on any highway, anywhere in the world. Goodridge is both TUV and DOT compliant, and are the OE Supplier to all of the major aftermarket brake manufactures; Alcon, AP, and Brembo. Goodridge quality approvals include QS9000, ISO 9001/9002 and TUV/DOT.